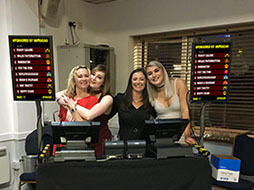 Race night bets are entered in to the computerised tote system and instantly printed out. This betting slip contains the race number, horse number, name of horse, amount staked, bet time and a unique barcode which is used for security checks. When all bets have been placed the computerised tote system will calculate the payouts on a 50/50* split between the fundraisers and winning tickets. These payouts are then displayed on to the screen. Every ticket which is scanned, is checked and if valid displays the winnings amount to be paid. Unclaimed tickets remain on the system, and can be claimed until the end of your race night. Invalid or losing betting slips will be rejected and payouts cannot be made twice on the same betting slip. 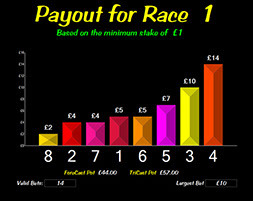 The payout for each horse number is displayed from the smallest payout to the largest. Dual forecast and Tri-cast bets have the option to roll-over to the next race. This way the pot increases throughout the night and makes for a great payout. * 50/50 split of total money taken on each race. Maximum amount for the fundraiser is 50%.